The Organization of American States (Spanish: Organización de los Estados Americanos, Portuguese: Organização dos Estados Americanos, French: Organisation des États américains), or the OAS or OEA, is a continental organization that was founded on 30 April 1948, for the purposes of regional solidarity and cooperation among its member states. Headquartered in the United States capital Washington, D.C., the OAS’s members are the 35 independent states of the Americas. As of 26 May 2015, the Secretary General of OAS is Luis Almagro. The notion of an international union in the New World was first put forward during the liberation of the Americas by José de San Martín and Simón Bolívar who, at the 1826 Congress of Panama (still being part of Colombia), proposed creating a league of American republics, with a common military, a mutual defense pact, and a supranational parliamentary assembly. This meeting was attended by representatives of Gran Colombia (comprising the modern-day countries of Colombia, Ecuador, Panama and Venezuela), Argentina, Peru, Bolivia, The United Provinces of Central America, and Mexico but the grandly titled “Treaty of Union, League, and Perpetual Confederation” was ultimately ratified only by Gran Colombia. Bolívar’s dream soon floundered with civil war in Gran Colombia, the disintegration of Central America, and the emergence of national rather than New World outlooks in the newly independent American republics. Bolívar’s dream of American unity was meant to unify Hispanic American nations against external powers. The pursuit of regional solidarity and cooperation again came to the forefront in 1889–1890, at the First International Conference of American States. Gathered together in Washington, D.C., 18 nations resolved to found the International Union of American Republics, served by a permanent secretariat called the Commercial Bureau of the American Republics (renamed the International Commercial Bureau at the Second International Conference in 1901–1902). These two bodies, in existence as of 14 April 1890, represent the point of inception to which the OAS and its General Secretariat trace their origins. At the Fourth International Conference of American States (Buenos Aires, 1910), the name of the organization was changed to the Union of American Republics and the Bureau became the Pan American Union. 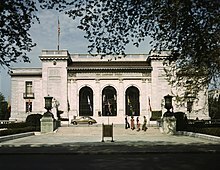 The Pan American Union Building was constructed in 1910, on Constitution Avenue, Northwest, Washington, D.C.
Pan American Union headquarters building in Washington, D.C., 1943. In the mid-1930s, U.S. President Franklin Delano Roosevelt organized an inter-American conference in Buenos Aires. One of the items at the conference was a “League of Nations of the Americas”, an idea proposed by Colombia, Guatemala, and the Dominican Republic. At the subsequent Inter-American Conference for the Maintenance of Peace, 21 nations pledged to remain neutral in the event of a conflict between any two members. The experience of World War II convinced hemispheric governments that unilateral action could not ensure the territorial integrity of the American nations in the event of external aggression. To meet the challenges of global conflict in the postwar world and to contain conflicts within the hemisphere, they adopted a system of collective security, the Inter-American Treaty of Reciprocal Assistance (Rio Treaty) signed in 1947 in Rio de Janeiro. The Ninth International Conference of American States was held in Bogotá between March and May 1948 and led by United States Secretary of State George Marshall, a meeting which led to a pledge by members to fight communism in the western hemisphere. This was the event that saw the birth of the OAS as it stands today, with the signature by 21 American countries of the Charter of the Organization of American States on 30 April 1948 (in effect since December 1951). The meeting also adopted the American Declaration of the Rights and Duties of Man, the world’s first general human rights instrument. The transition from the Pan American Union to OAS would have been smooth if it had not been for the assassination of Colombian leader Jorge Eliécer Gaitán. The Director General of the former, Alberto Lleras Camargo, became the Organization’s first Secretary General. The current Secretary General is former Uruguayan minister of foreign affairs Luis Almagro. 1959: Inter-American Commission on Human Rights created. 1959: Inter-American Development Bank created. 1961: Charter of Punta del Este signed, launching the Alliance for Progress. 1969: American Convention on Human Rights signed (in force since 1978). 1970: OAS General Assembly established as the Organization’s supreme decision-making body. 1979: Inter-American Court of Human Rights created. 1991: Adoption of Resolution 1080, which requires the Secretary General to convene the Permanent Council within ten days of a coup d’état in any member country. 1994: First Summit of the Americas (Miami), which resolved to establish a Free Trade Area of the Americas by 2005. 2001: Inter-American Democratic Charter adopted. 2009: OAS revokes 1962 suspension of Cuba. 2009: OAS suspends Honduras due to the coup which ousted president Manuel Zelaya. 2011: OAS lifts the suspension of Honduras with the return of Manuel Zelaya from exile. 2017: Venezuela announces it will begin the process to leave the OAS in response to what it alleged was OAS interference in Venezuela’s political crisis. To strengthen the peace and security of the continent. To promote and consolidate representative democracy, with due respect for the principle of non-intervention. To prevent possible causes of difficulties and to ensure the pacific settlement of disputes that may arise among the member states. To provide for common action on the part of those states in the event of aggression. To seek the solution of political, judicial, and economic problems that may arise among them. To promote, by cooperative action, their economic, social, and cultural development. To eradicate extreme poverty, which constitutes an obstacle to the full democratic development of the peoples of the hemisphere. To achieve an effective limitation of conventional weapons that will make it possible to devote the largest amount of resources to the economic and social development of the member states. Strengthening democracy: Between 1962 and 2002, the Organization sent multinational observation missions to oversee free and fair elections in the member states on more than 100 occasions. The OAS also works to strengthen national and local government and electoral agencies, to promote democratic practices and values, and to help countries detect and defuse official corruption. Working for peace: Special OAS missions have supported peace processes in Nicaragua, Suriname, Haiti, and Guatemala. The Organization has played a leading part in the removal of landmines deployed in member states and it has led negotiations to resolve the continents’ remaining border disputes (Guatemala/Belize; Peru/Ecuador). Work is also underway on the construction of a common inter-American counter-terrorism front. Defending human rights: The agencies of the inter-American human rights system provide a venue for the denunciation and resolution of human rights violations in individual cases. They also monitor and report on the general human rights situation in the member states. Fostering free trade: The OAS is one of the three agencies currently engaged in drafting a treaty aiming to establish an inter-continental free trade area from Alaska to Tierra del Fuego. Fighting the drugs trade: The Inter-American Drug Abuse Control Commission was established in 1986 to coordinate efforts and crossborder cooperation in this area. Promoting sustainable development: The goal of the OAS’s Inter-American Council for Integral Development is to promote economic development and combating poverty. OAS technical cooperation programs address such areas as river basin management, the conservation of biodiversity, preservation of cultural diversity, planning for global climate change, sustainable tourism, and natural disaster mitigation. The Organization of American States is composed of an Organization of American States General Secretariat, the Permanent Council, the Inter-American Council for Integral Development, and a number of committees. The General Secretariat of the Organization of American States consists of six secretariats. A session of the OAS’s thirty-fifth General Assembly in Fort Lauderdale, Florida, United States, June 2005. The General Assembly is the supreme decision-making body of OAS. It convenes once every year in a regular session. In special circumstances, and with the approval of two-thirds of the member states, the Permanent Council can convene special sessions. The Organization’s member states take turns hosting the General Assembly on a rotating basis. The states are represented at its sessions by their chosen delegates: generally, their ministers of foreign affairs, or their appointed deputies. Each state has one vote, and most matters—except for those for which the Charter or the General Assembly’s own rules of procedure specifically require a two-thirds majority—are settled by a simple majority vote. The General Assembly’s powers include setting the OAS’s general course and policies by means of resolutions and declarations; approving its budget and determining the contributions payable by the member states; approving the reports and previous year’s actions of the OAS’s specialized agencies; and electing members to serve on those agencies. ^ Suspended between 1962–2009. Has chosen not to resume their participation. See Status of Cuba below. ^ Suspended between 2009–2011. See Suspension of Honduras below. Although Canada was a founding member of the League of Nations in 1919 and has joined international organizations since that date, it chose not to join the OAS when it was first formed, despite its close relations with the United States. Canada became a Permanent Observer in the OAS on 2 February 1972. Canada signed the Charter of the Organization of American States on 13 November 1989 and this decision was ratified on 8 January 1990. In 2004–2005, Canada was the second largest contributor to the OAS, with an annual assessed contribution representing 12.36 percent of the OAS Regular Budget (US$9.2 million) and an additional C$9 million in voluntary contributions to specific projects. Shortly after joining as a full member, Canada was instrumental in the creation of the Unit for the Promotion of Democracy, which provides support for the strengthening and consolidation of democratic processes and institutions in OAS member states. During the 6th Conference of Foreign Ministers of the Organization of American States (OAS) in Costa Rica, from 16 to 20 August 1960, a conviction against the State of the Dominican Republic was agreed to unanimously. The penalty was motivated because the foreign ministers checked the veracity of the claim that the Rafael Trujillo regime had sponsored an attack against Rómulo Betancourt, at that time, constitutional president of Venezuela. The meeting was attended by foreign ministers from 21 American nations, including Cuba, which at that time had not yet been expelled from the inter-American system. All countries, including the United States and Haiti, broke off diplomatic relations with the Dominican Republic. Additionally an economic blockade that affected the exports of sugar was applied, which at that time was the pillar of the Dominican economy. It was the first application of the Inter-American Treaty of Reciprocal Assistance, which had been adopted at the OAS on July 29, 1960. #That adherence by any member of the Organization of American States to Marxism-Leninism is incompatible with the inter-American system and the alignment of such a government with the communist bloc breaks the unity and solidarity of the continents. That the present Government of Cuba, which has officially identified itself as a Marxist-Leninist government, was incompatible with the principles and objectives of the inter-American system. That this incompatibility excluded the present Government of Cuba from participation in the inter-American system. This meant that the Cuban nation was still technically a member state, but that the current government was denied the right of representation and attendance at meetings and of participation in activities. The OAS’s position was that although Cuba’s participation was suspended, its obligations under the Charter, the American Declaration of the Rights and Duties of Man, etc. still hold: for instance, the Inter-American Commission on Human Rights continued to publish reports on Cuba’s human rights situation and to hear individual cases involving Cuban nationals. However, this stance was occasionally questioned by other individual member states. The reincorporation of Cuba as an active member regularly arose as a topic within the inter-American system – for instance, it was intimated by the outgoing ambassador of Mexico in 1998 – but most observers did not see it as a serious possibility while the present government remained in power. Since 1960, the Cuban administration had repeatedly characterized the OAS as the “Ministry of Colonies” of the United States of America. On 6 May 2005, President Fidel Castro reiterated that the island nation would not “be part of a disgraceful institution that has only humiliated the honor of Latin American nations.” After Fidel Castro’s recent retirement and the ascent of his brother Raúl to power, this official position was reasserted. Venezuelan President Hugo Chávez promised to veto any final declaration of the 2009 Summit of the Americas due to Cuba’s exclusion. On 17 April 2009, after a “trading of warm words” between the administrations of U.S. President Barack Obama and Cuban leader Raúl Castro, OAS Secretary General José Miguel Insulza said he would ask the 2009 General Assembly to annul the 1962 resolution excluding Cuba. Those attending the Extraordinary Assembly of the OAS voted to suspend Honduras. Following the expulsion of its President Manuel Zelaya, Honduras’ membership of the Organization was suspended unanimously at midnight on 5 July 2009. The de facto government had already announced it was leaving the OAS hours earlier; this was not, however, taken into account by the OAS, which did not recognize that government as legitimate. An extraordinary meeting had been conducted by the OAS in Washington, D.C., with Zelaya in attendance. The suspension of Honduras was approved unanimously with 33 votes (Honduras did not vote). This was the first suspension carried out by the OAS since that of Cuba in 1962. After Zelaya’s return to Honduras in 2011, the country was re-admitted to the Organization on 1 June 2011 with 32 votes in favor and 1 (Ecuador) against. Venezuela expressed some reservations. On 26 April 2017, Venezuela announced its intention to withdraw from the OAS. Venezuelan Foreign Minister Delcy Rodríguez said that President Nicolás Maduro planned to publicly renounce Venezuela’s membership on 27 April 2017. It would take two years for the country to formally leave. During this period, the country does not plan on participating in the OAS. During the 2019 Venezuelan presidential crisis, the National Assembly — recognized in January 2019 by the OAS as the sole leading body in the country — designated a special envoy as representative to the OAS, the lawyer Gustavo Tarre Briceño [es]. As of 31 January 2014, there are 69 permanent observer countries including the four countries with territory or territories in the Americas—Denmark, France, the Netherlands, and the United Kingdom; as well as the European Union. Statue of Isabella I the Catholic in front of the seat of the Organization of American States in Washington D.C. The Organization’s official languages are Spanish, Portuguese, French and English. The Charter, the basic instrument governing OAS, makes no reference to the use of official languages. These references are to be found in the Rules of Procedure governing the various OAS bodies. Article 51 of the Rules of Procedure of the General Assembly, the supreme body of the OAS, which meets once a year, states that English, French, Portuguese and Spanish are the four official languages. Article 28 stipulates that a Style Committee shall be set up with representatives of the four official languages to review the General Assembly resolutions and declarations. Article 53 states that proposals shall be presented in the four official languages. The Rules of Procedure and Statutes of other bodies, such as the Inter-American Council for Integral Development (CIDI), the Permanent Executive Committee of the Inter-American Council for Integral Development (CEPCIDI), the Inter-American Commission of Women (CIM), the Inter-American Drug Abuse Control Commission (CICAD), the Inter-American Commission on Human Rights (IACHR) and the Inter-American Juridical Committee (CJI), technical bodies of the OAS, also mention the four official languages in which their meetings are to be conducted. Policy is therefore dictated through these instruments that require use of the four official languages at meetings. Although a number of other languages have official status in one or more member states of OAS (Dutch in Suriname; Haitian Creole alongside French in Haiti; Quechua and Aymara in Peru, Ecuador and Bolivia; Guaraní in Paraguay), they are not official languages of the Organization. ^ WYSS, JIM. “As a Uruguayan is poised to head the OAS, questions swirl about Venezuela”. Miami Herald. Miami Herald. Retrieved 18 March 2015. ^ “Panama: A Country Study”. Washington: GPO for the Library of Congress, 1987. ^ Special to the New York Times. “League of Nations in Americas urged by 3 Latin states”, The New York Times. April 13, 1936. p. 1. ^ “Americas adopt neutrality pact”, The New York Times. December 20, 1936. ^ “Member States”. OAS. Retrieved 2012-11-01. ^ “Cuba Will Not Return to the OAS”. Havana Times. 2014-01-24. ^ “OAS readmits Honduras to its ranks”. CNN. 2011-06-01. Retrieved 2012-11-01. ^ Canada and the Organization of American States Archived 2009-01-23 at the Wayback Machine, Foreign Affairs and International Trade Canada (DFAIT), 2005. ^ Canada and the Organization of American States by Dr. Ludwil J. Kos-Rabcewicz-Zubkowski, Air University Review, September–October 1967. ^ Canada and the OAS: A Vigorous Partnership Archived 2005-02-19 at the Wayback Machine, Canada World View, Issue 8, Summer 2000. ^ “Six Report on the Situation of Political Prisoners in Cuba”. Inter-American Commission on Human Rights. Organization of American States. 1979-12-14. ^ “The Situation of Human Rights in Cuba: Seventh Report”. Inter-American Commission on Human Rights. Organization of American States. 1983-10-04. ^ “Mexico Calls for Cuba’s Reinstatement into the OAS” (Press release). Organization of American States. 1998-02-04. Organization of American States. ^ “The Testing of the OAS”. Time. 1960-08-22. ^ Solis, Marta (1972-04-26). “Castro admits problems in education”. Siempre. Latin American Network Information Center, University of Texas at Austin. pp. 40–41. ^ “Fidel Castro: OAS Is an Instrument of the US”. Prensa Latina. Havana, Cuba. 2006-05-07. Archived from the original on 2008-10-11. ^ “Chavez threatens veto over Cuba”. BBC News Online. 2009-04-17. Retrieved 2009-04-17. ^ “U.S., Cuba trade warm words ahead of summit”. msnbc.com. 2009-04-17. Retrieved 2009-04-17. ^ “Declaration of the Revolutionary Government”. Granma. 2009-06-08. Archived from the original on 2012-02-19. Retrieved 2009-06-15. ^ a b c d “Americas group suspends Honduras”. BBC. 2009-07-05. Retrieved 2009-07-05. ^ “Honduras leaders pull out of OAS”. RTÉ. 2009-07-04. Retrieved 2009-07-05. ^ “OAS expels Honduras’ membership over coup”. China Daily. 2009-07-05. Retrieved 2009-07-05. ^ a b c Hipwell, Deirdre (2009-07-05). “Organisation of American States suspends Honduras over coup”. London: The Times. Retrieved 2009-07-05. ^ Press Releases :: E-698/11. OAS. Retrieved on 2013-07-12. ^ “Venezuela to withdraw from OAS as deadly protests continue”. BBC News. 2017-04-27. Retrieved 2017-04-27. ^ “Venezuela says it will quit Organization of American States”. Washington Post. Retrieved 2017-04-27. ^ “Tarre Briceño, primera designación gubernamental de la AN”. Efecto Cocuyo (in Spanish). Retrieved 23 January 2019. ^ SER :: DIA :: Permanent Observers. OAS. Retrieved on 2013-07-12. ^ “Montenegro Gains Observer Status to Organisation of American States”. February 4, 2014. Door Opens to OAS for Cuba by Thelma Mejia, Havana Times, 4 June 2009. Outdoor sculpture at the OAS headquarters building. OAS Lifts Ban On Cuba After 47 Years by Portia Siegelbaum, CBS News, 3 June 2009. Cuba’s Fidel Castro Calls OAS a “U.S. Trojan Horse” by Xinhua, 4 June 2009. The Organization of American States in Haiti: Election Monitoring or Political Intervention?, from the Center for Economic and Policy Research, October 2011.